Kaida Highland Kiso Horse Village (開田高原 木曽馬の里) is a stable of Kiso Horse located in Kiso Town, Nagano Prefecture. Kaida Highland is about 1,200m high from the sea level and very cool place even in summer. In this stable, there are 30 Kiso Horses. It's open for public and you can touch them free. 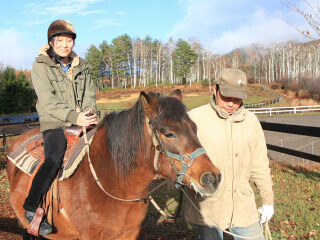 There are horse riding experience, draft riding, wagon tour and sled riding at winter. Kaida Highland Horse Village is a great stable with surrounding nature. It will be great family activity with nature and animals.